Successfully Added LED Gaming Headphones - Retractable Mic, Stereo Headphones, Built-in LED, Comfortable Padding, Durable Audio Lead to your Shopping Cart. Soft plush padding and adjustable head band assure you will have hours of gaming in comfort. Experience an ultimate sound experience when playing your favorite video games with these astonishing LED gaming headphones. 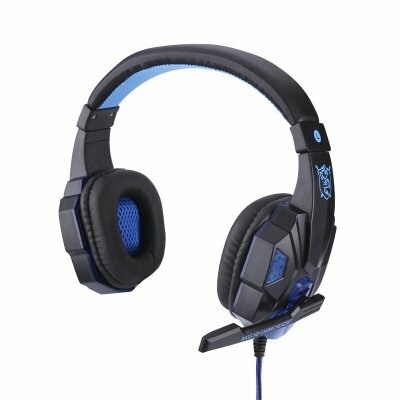 Whether you are making your way through some dark forest or mystical mountain range in the latest online MMORPG game, or are engaged in a severe battle while playing your favorite first person shooter, this gamer headset is guaranteed to take your experience to an entirely new level. Featuring noise canceling technology these LED headphones allow you to leave the real world behind and to get fully immersed into the latest virtual gaming worlds. With its cool and modern design this gamer’s headset features blue LED lights that form a stunning visual effect when used in the dark. With its comfortable padding and adjustable size this headphone is guaranteed to form a comfortable fit no matter the size of your head. Easily adjust the volume of your sound via the scroll switch that can be found on the side of your headphones. Coming with the latest audio technology this headset delivers a dynamic stereo sound effect. Double bass and subwoofer output additionally enhance your audio quality by delivering an authentic and realistic shock audio experience while playing your favorite games. With this game headset nothing stands in your way to lock yourself in your room and enjoy a day’s worth of games without ever getting interrupted by outside noise and sound. Featuring a microphone, this LED headphone lets you take your gaming experience another step further as now you will be able to engage in live chats through Team Speak while engaging in your virtual battles. No more need to type your messages and commands to team mates on your keyboard while getting distracted from the game – with its mic this headset allows you to easily and effortlessly stay in contact with any of your fellow gamers. For extra efficiency, the mic can be easily muted when not in use. With this LED headset it is not all about gaming. Additionally, it can be conveniently used to chat with friends on Skype or to simply listen to your favorite music. This gaming headset comes with a 12 months warranty, brought to you by the leader in game accessories as well as wholesale electronic gadgets..
Great product, with high-fidelity three-dimensional sound, great, great, no comparison, just perfect!